Good Half Day on the Smith…..
Fri. Aug. 30, 2013 ….Had a good half day guided trip on the Smith in Va, guided Dan Hale from Burlington, NC. We got a super early start and we were in the water at 715am. Nailed a nice brown on the 3rd cast and things were pretty steady all morning and we landed about a dozen including one nice 14" brown. 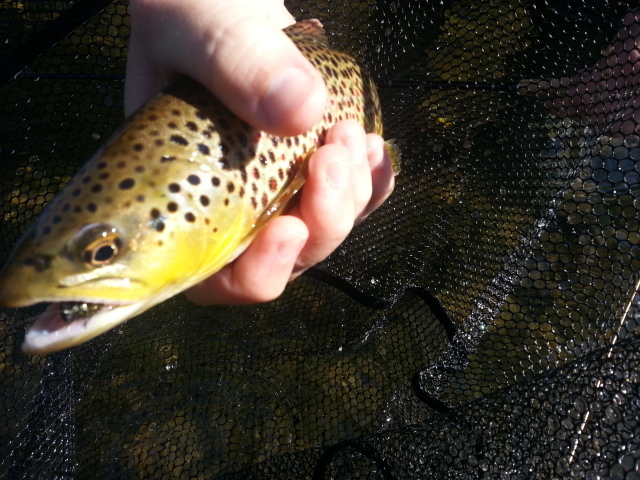 All wild browns, of course if its a brown in the Smith they are wild. 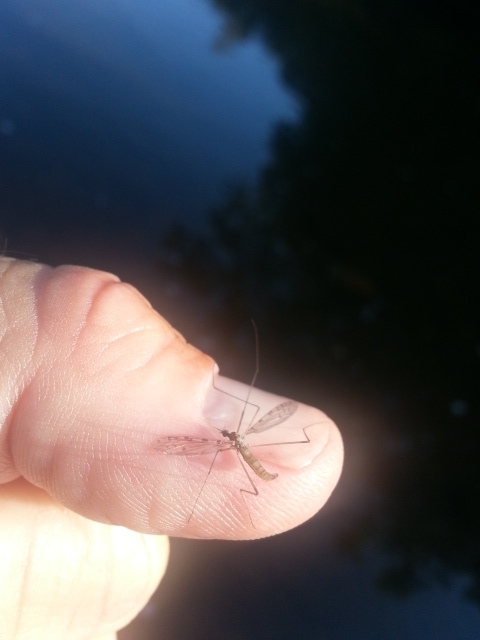 ….and we did best with a size 20 zebra midge dropper. There were a lot of folks on the river for a Friday….but hey I guess the Labor Day weekend crowd was out. In any case all the water we fished, about a mile total, we had to ourselves. Have a 3 angler trip tomorrow on the SoHo guiding Scott Henegar and his group. Looking forward to a good day. Have a great and safe Labor Day Weekend…..
Nice Day to Be on the Water….Challenging Fishing ! Mon. Aug 26, 2013…. Incredibly nice day to be outside….is this August in Carolina? This morning felt more like Fall. 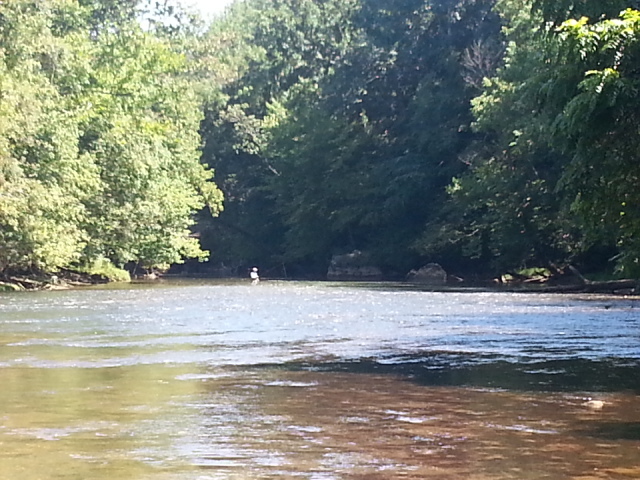 Did a guided Trip, Dr. Jim & Martha Kaley, Greensboro, NC,we did a half day on the lower Smith….love it that this water is 35 min from my doorstep. 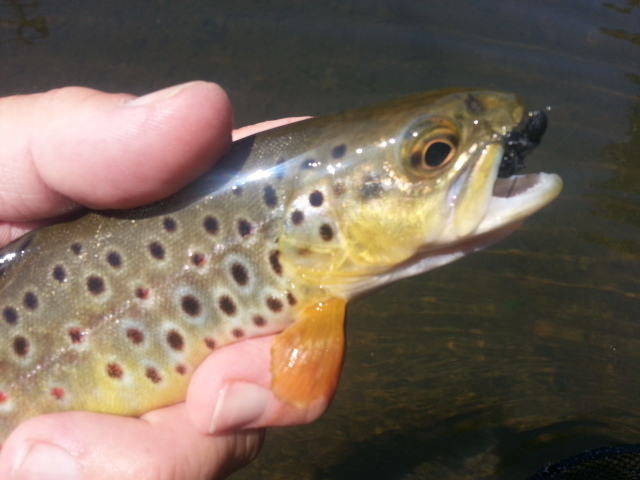 It was pretty good early, a lot of rising fish, tons of egg laying caddis, craneflies, some bwo spinners, a few mahogany duns (slate drakes) and the fish were tough. 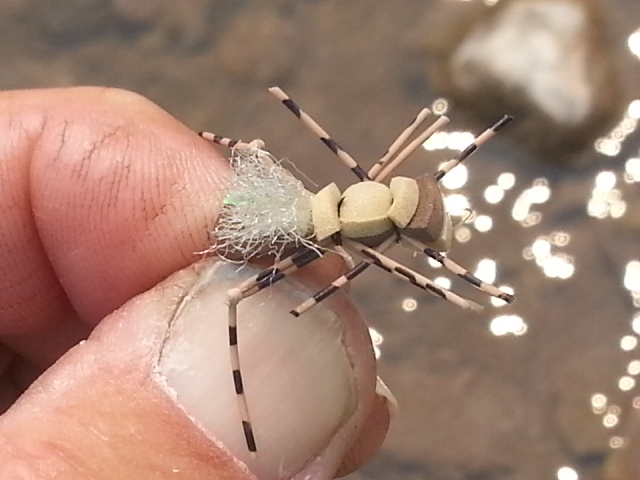 We caught some fish early on terrestrials, my favorite ant pattern…a ‘Jeff’s Ant’ outperformed every beetle in the box, though we caught some on beetles. The fish were one and done today. You got one shot. We had one spot early in which Jim and I stalked two large fish cruising that were working the shallows…one cast, we got both of them to eat. 2 for 2. And in a spot where I’d go out on a limb and say 98% of folks fish the Smith couldn’t catch a fish…its flat, slick, bright sun, on a scale of 1 to 10 its a 9.9 in terms of difficulty. And we got both large cruising fish we saw to eat an ant. 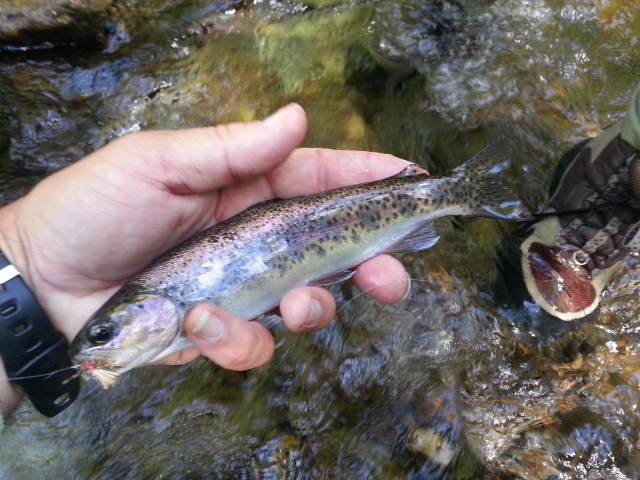 We caught a handful of fish on dry /dropper rigs as we worked our way back downstream. We hit one more spot right before lunch, Jim nailed another fish on the beetle while Martha and I stalked a lone sipper that was rising on the bank. It was in a tough spot too, I gave Martha instruction on where to place the fly, she made two false casts and dropped a near perfect cast right where it needed to be. 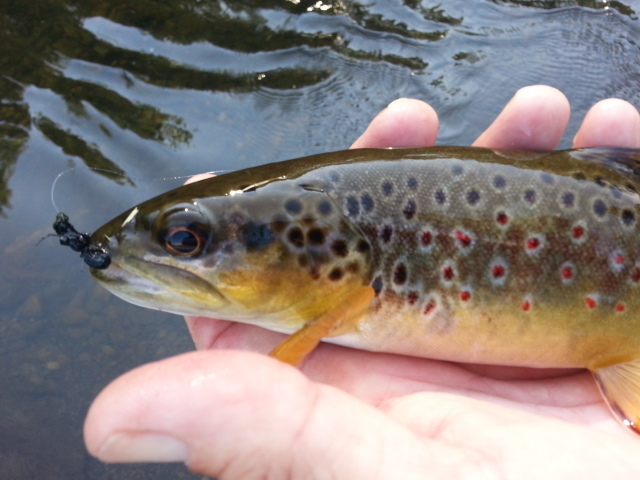 Bingo….the brown rose slowly and sipped the Jeff’s ant in confidently and we had one more brown to net. Released that fish and we saw another fish rise, and Martha again placed a good cast right on the mark and the fish sipped in one of my CDC tailwater duns. 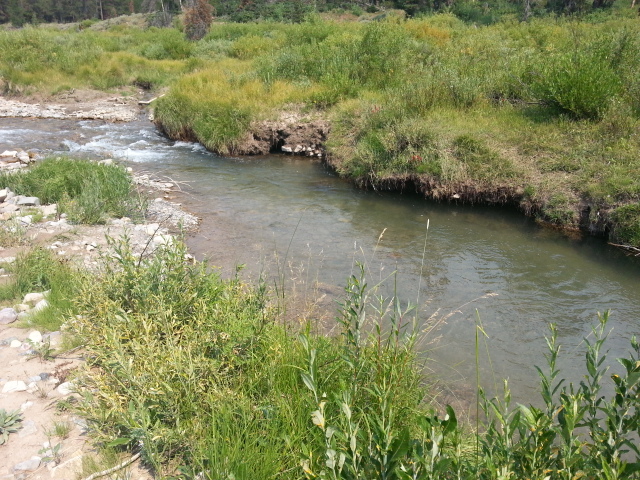 The water began to rise so we hopped in the SUV and headed down to where had a streamside lunch under the shade of some nice trees. After enjoying our lunch in the cool shade and with a nice breeze from the river we then packed it in and headed downstream to another spot. When we got in there were a few fish rising, Jim nailed one nice brown on a zebra midge dropper and several small browns, probably a half dozen of them in short order in the same spot. Martha and I went to one last tailout and stalked some risers, and man were they tough. She caught one of them, on a beetle. And that was the last fish we caught before the water came up on us again. We went to one other spot hoping to make one last cast but in this area its so far below Martinsville the water had become muddy from a couple creeks that come into the river. So we ended on that …..it was challenging fishing today, plenty of chances, some that we took great advantage of, some we missed, we broke off a good many nice fish (which you’ll do fishing long range with light fluoro tippet) but all in all it was a nice day, always a great time with Jim and Martha, who have been clients of mine for many years. Have a couple of open days coming up if I get some trips or lessons I’ll be doing that if not I will be resting a bit of a neck /shoulder ailment. Getting old stinks for sure. I think maybe in addition to SAGE, SIMMS, and ROSS for sponsorships maybe ALEVE and IBUPROFEN would be a good one as well…lol. Beetles and Ants are hard to beat when things get slow or you aren’t seeing a lot of noticeable activity. They can be both a game changer and trip saver. I never go out without them this time of year. And they’ll be good til the first frost. Mon. Aug. 27, 2013……Awesome morning it feels like fall. Cool and crisp I love it. The fish are loving it as well. Headed out this morning to guide Dr Jim and Martha Kaley and looking forward to a good day as we will be chucking terrestrial patterns. Nice Day On Home Waters…. Sat. 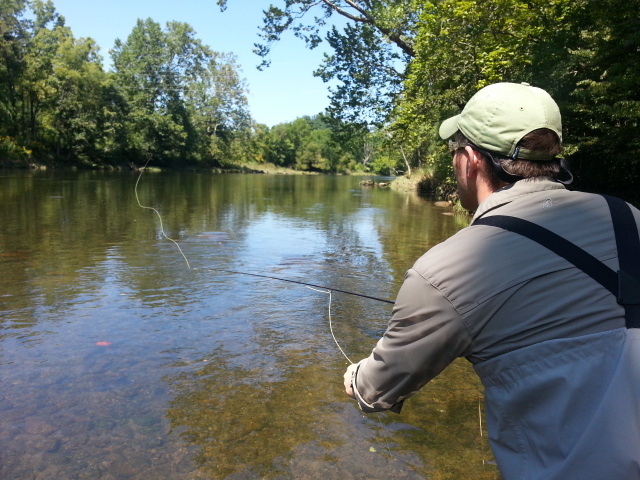 Aug. 24, 2013…..Great morning, did a full day guided trip , Dr. Jason Steinbicker, Clemmons, NC,South Holston, we got a super early start, definitely one of the nicest weather days of the year, it was cool with low humidity, felt like a fall morning. 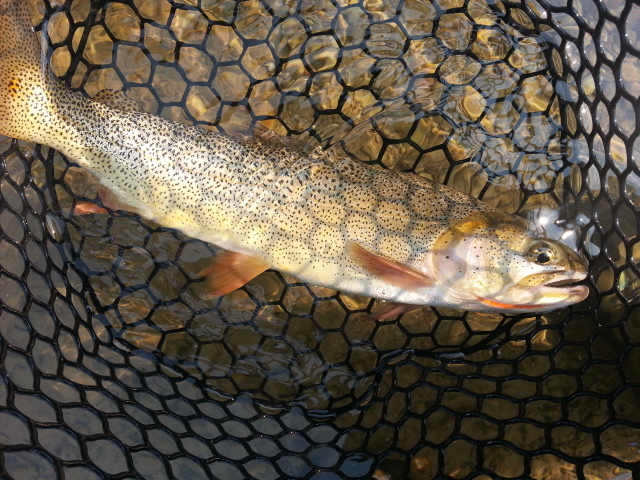 It was great, we started with a dry dropper rig and a nymph rig and nailed several nice fish on those, all browns, then a mix of nice browns and rainbows, we also hit a stint where we nailed a lot of nice fish on beetles, casting to sippers we could see. We then got a little bit of a blue winged olive flurry, caught several on small dries. Broke off several fish again on beetles, some nice fish, then switched back to a dry and dropper rig and caught maybe 6 or so at the last places we fished. 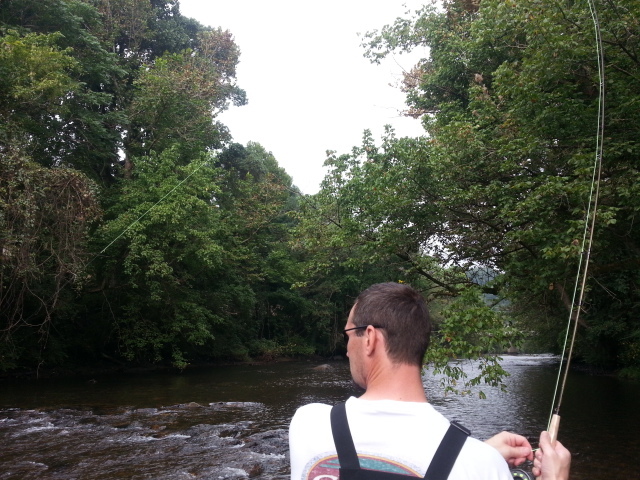 Good day, probably 30 fish or so….it was great. Jason is a great caster and beetle fishing is so much fun with a great caster….a beetle and a good distance caster = many hookups. A good end to a very busy week back from our Wyoming adventure……..whew, little time to catch my breath. Get a day off/home tomorrow (Sunday), will enjoy a day of rest and have another trip on Monday, guiding two longtime friends/clients Dr. Jim and Martha Kaley. Should be another great day. Thurs. 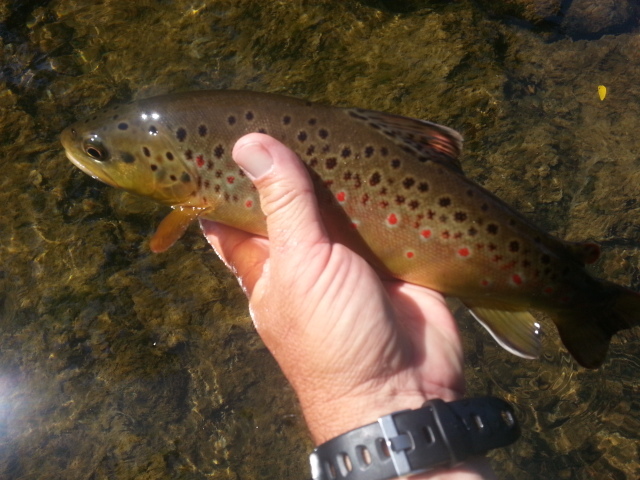 Aug 22, 2013…….While I miss Wyoming and many things of the West, namely huge cutthroats eating large dry flies….I am glad to be home. It was a challenge getting back in the swing of things this week. So much catch up to do, I must say I felt like I was behind the 8 ball so to speak all week. And I still haven’t caught up! WYOMING UPDATE.….Finally got all our gear shipped in, everything made it here ok once again…and I have finally managed to load all our trip photos. You can click the link below to see the entire trip photo album. 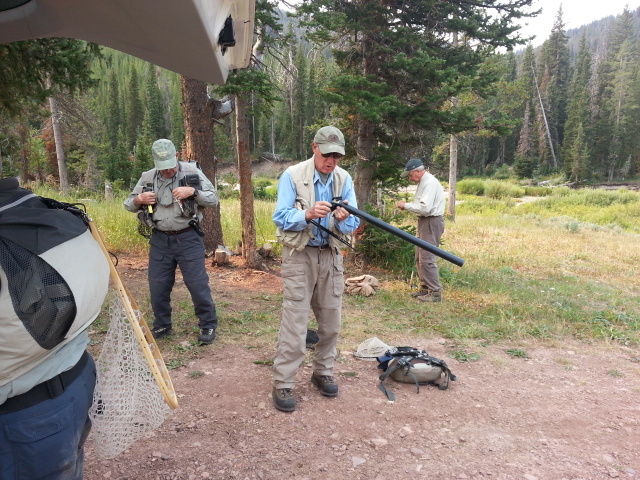 If you ever wanted to get in on this trip now is a great time…..already have 3 and perhaps 4 of the 6 slots for Wyoming 2014 filled……Let’s Go Fly Fishing in Wyoming! On a different note, our first South Holston Oct 15-17 trip was a Sell out, so due to customer request I am offering a second trip as well Oct 22-24, 2013…had more interested people than we had slots! 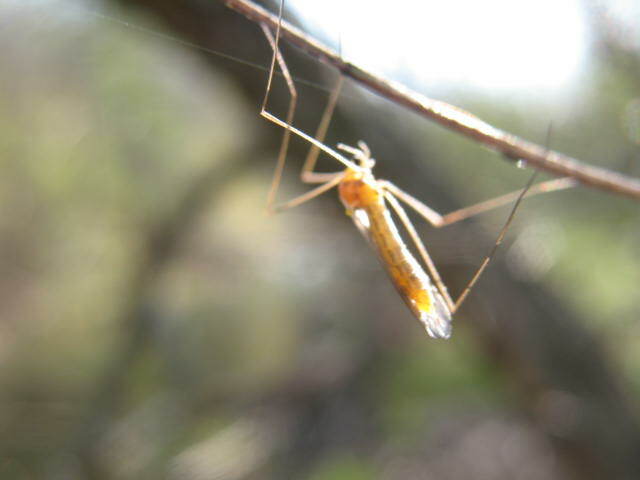 In any case, Oct 22-24 is still a great time, fishing will be the same as the week before, and there’ll still be some sulphurs on the upper river, and blue winged olives throughout. Should be a great time. I have 3 open slots ….If interested in the Oct 22-24 dates you can let me know here , or you can go online and purchase your slot here . Its first come, first served. Once they are sold, that’s all folks! Let’s Go Fly Fishing! Had some pretty decent fishing earlier in the week guiding a friend and client Ho Young Lee from Charlotte, NC. Fishing was good right from the outset. 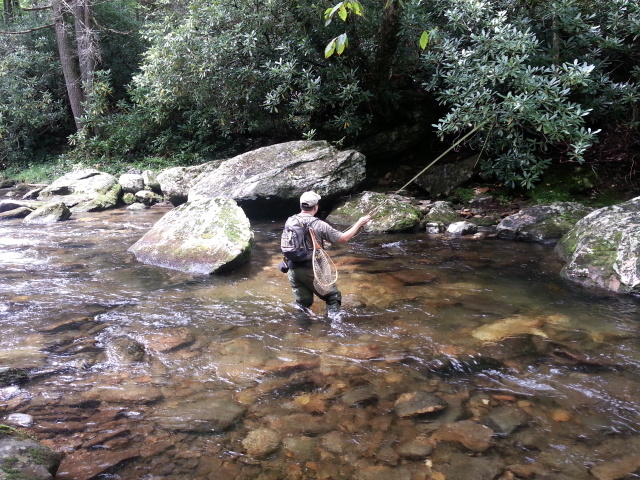 We fished some wild waters in Yancey Co, NC, met up with the guys in Morganton and we headed off for the hills. Ho and three of his friends/associates, who were in from NY, Chris, Jimmy, and Larry, and we got in the water a little before 830am. It was nice, cool, just a great day to be outside. Ho is an experienced angler, the other guys just learning so we did a fly fishing 101 lesson to begin with and talked about casting, reading water, Presenting the fly, line management, etc., and once I felt the guys were in a position to be able to catch fish we proceeded with fishing. Had several right off from the start, all rainbows….Jimmy scored first. We fished our way up river, leapfrogging here, there, and catching fish the whole way. The river was in excellent condition, best mid to late August conditions on a small native trout stream I have ever seen…..Ever seen…..EVER seen. 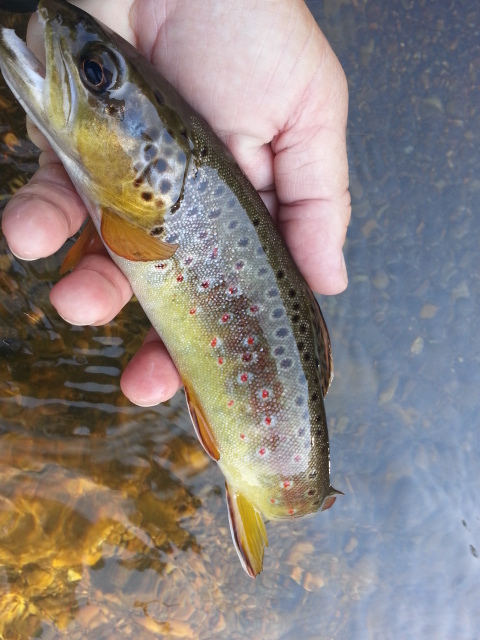 Though its a damper on many plans the wet summer and cool temps have our small native trout streams on cloud nine. The fish are lovin’ it. The fish were on the eat as well, we caught fish from the start and steadily all day. We finished up with a lot of fish, particularly for a first day….and we caught them on a variety of dries and dry /dropper rigs. PHOTOS from the Day ….click here . 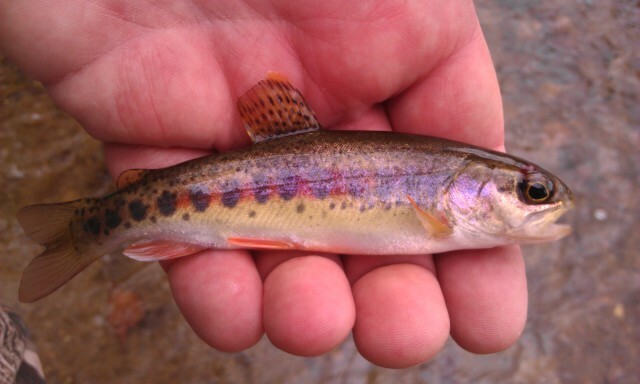 The true ‘Braveheart’ of the National Forest, a native small stream Southern Appalachian rainbow….this guy earns his meat n taters the honest way……and not from a hatchery bucket……. Jeff Wilkins photo Aug 2013. Have a great evening….have a day tomorrow of winding up catching up on messages and emails and a few fly orders as well. 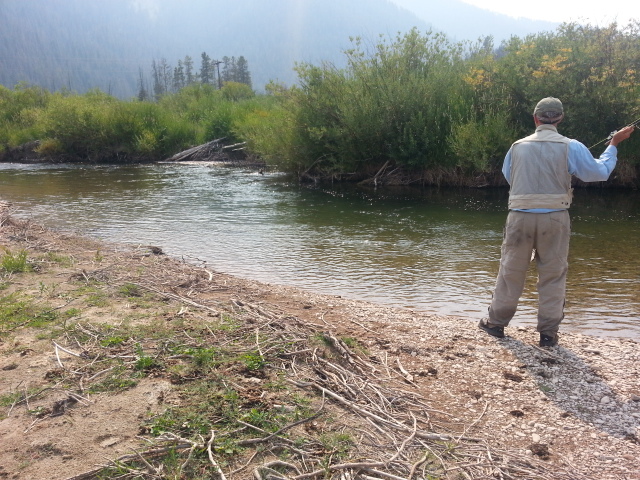 Will be heading out on Saturday to guide a trip so until then have a great one…..
Tues. Aug. 20, 2013…..After a few weeks out West its good to be home catching some TarHeel trout. Nice cool morning yet again and its super foggy as well. Looks like 60 to 80% rain chances today…..hopefully it will hold off until late afternoon. Today I am guiding Ho Lee, Charlotte, NC, a regular client of mine, and he is bringing three of his clients from NY and treating them to a day of fly fishing. 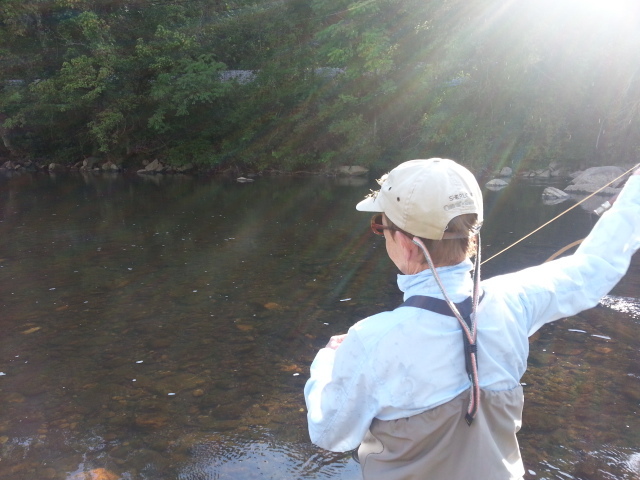 We are fishing some hike in wild trouting…. Sun. Aug. 18, 2013…. At least that is what it looks like. Early departure from my hotel this morning and I am at Dulles Intl awaiting my flight and should be back in Greensboro by 930am. Looking forward so much to getting home…..
Wyoming 2014 is already in the works, and I have three signups for it which leaves 3 slots open. Would live to have you join me next year …..its a blast! 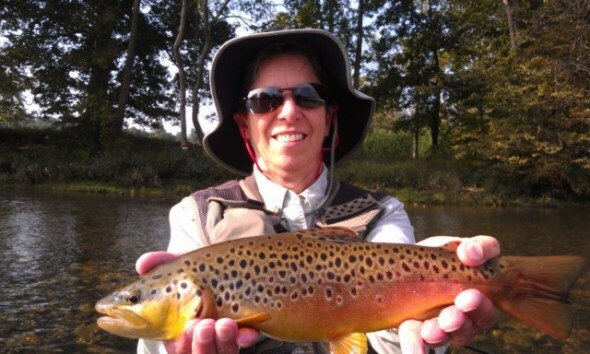 Our South Holston October trip is sold out and I am offering a second date for another trip. Will post details this week. Early Start, Hopefully Home Soon! 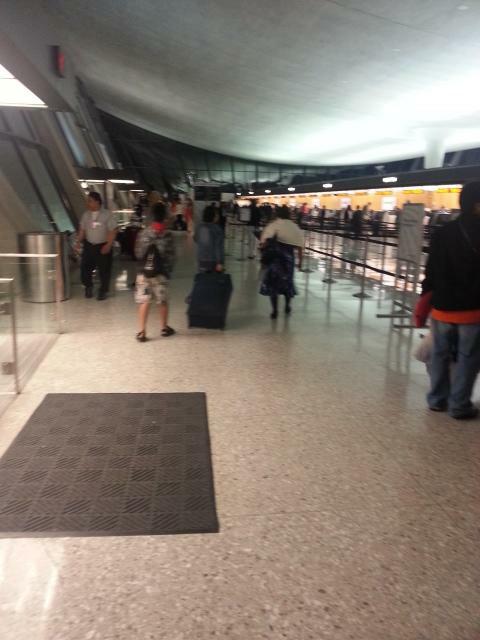 Have an early flight and am looking forward to being back in Carolina…..Have a great one! Sat. 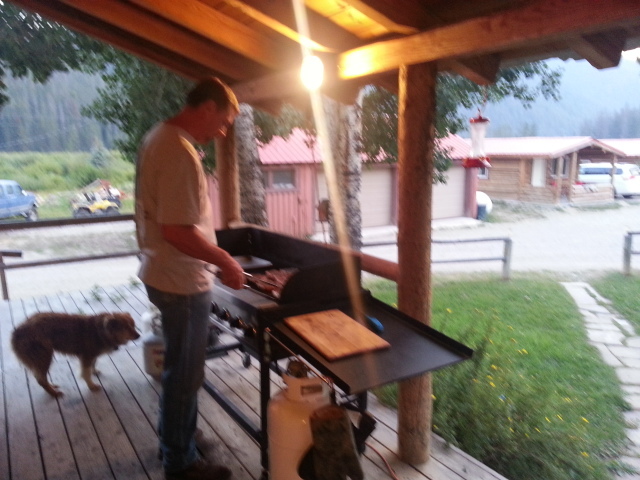 Aug. 17, 2013….Got in pretty late yesterday to the ranch we were staying at here in Bondurant, WY. We had a fantastic breakfast prepared by our host Carlton Loewer and then we were off to the remote Greys River. We drove the Snake River canyon road past Lunch Counter and Taco Hole and Sheep Gulch. …some of the best whitewater on the Snake, en route to Alpine Junction, WY. We fished the remote upper Greys River above Alpine, WY and had a decent time of it catching wild cutthroats on a variety of flies. It was hot, unlike the rest of the past two weeks, it was near 92F…..kind of slowed the fishing a little. We pulled out of the Greys Canyon and enjoyed a great dinner at the Flying Saddle….a Porter House porkchop with a vegetable medley and garlic mashed potatoes….great stuff. We then returned to the ranch to pack up and we departed from the ranch at 345am this morning. 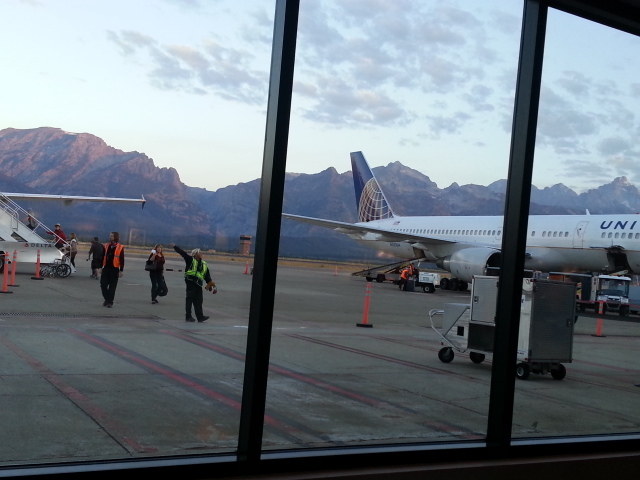 We are currently waiting to takeoff from Jackson Hole Airport….and in an hour we will be in Denver, CO .
Looks like we will arrrive to a wet and cool Carolina……looking forward to home. Great trip , what a great group of guys and I thank them all. This trip was a blast and one of our best ever. One of the guys said "you set the expectation bar high and exceeded it…..this has been incredible." I love hearing that……have a great one! Good Day in Bondurant, Fishing Was So…So…. Fri. Aug. 16, 2013….. Just waking up here in sleepy and chilly Bondurant, WY, where its near the freezing mark. 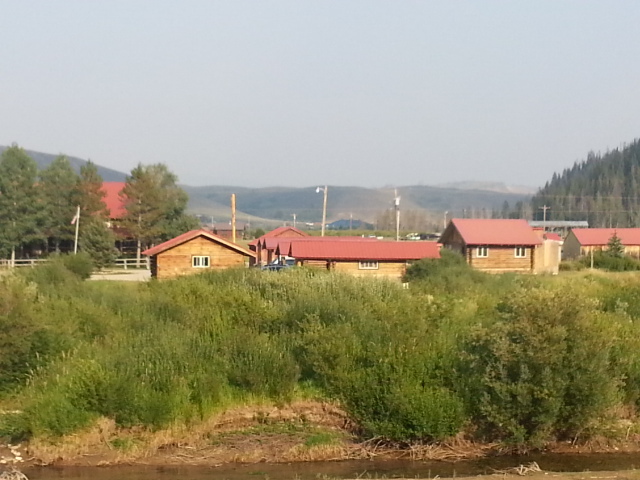 Brrrr…..frost on the roof tops as I left my cabin on the Hoback River and walked over to the main lodge. 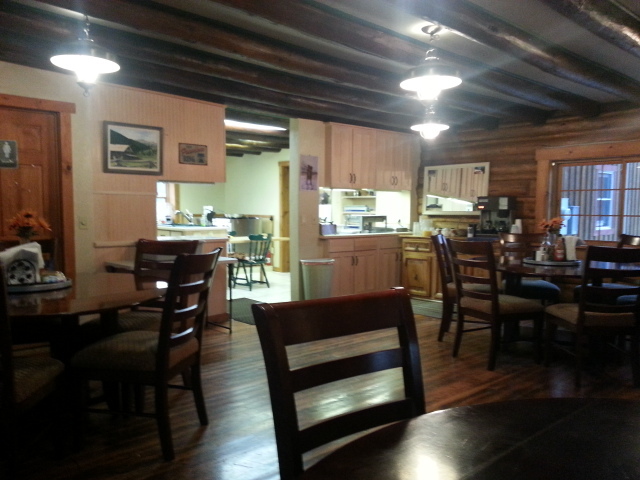 We are getting ready to enjoy I guess the last of our cowboy breakfasts…..that is eggs, bacon, sausage gravy and biscuits, homemade strawberry yogurt…….and more coffee than you can drink. Thanks to our host and friend Carlton Loewer its been great the past few days. 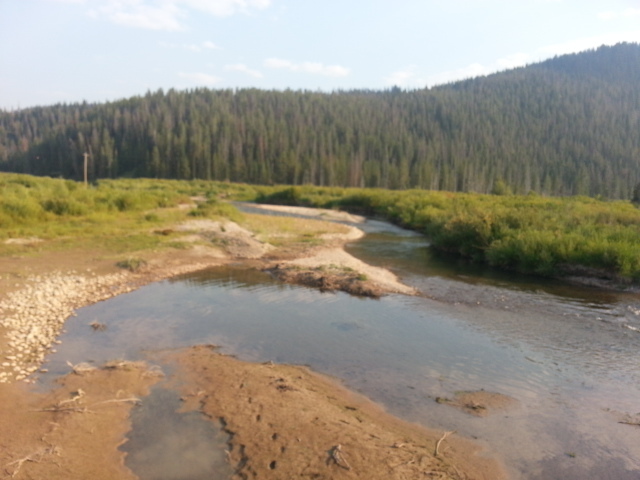 We have today’s fishing on the Greys River in a remote area of Bridger Teton Wilderness and we’ll be going about 25 miles in. Not only have we enjoyed some great fishing but great food but an added bonus have been some great doggies along the way. 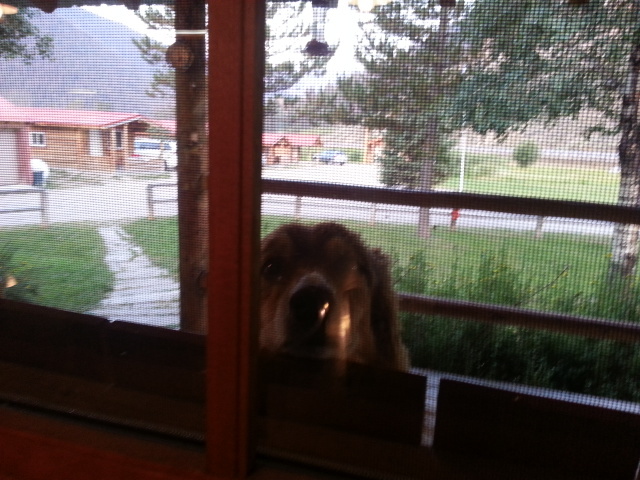 From our camp dog Mia to the two lodge pooches Shep and Pete its been fun. 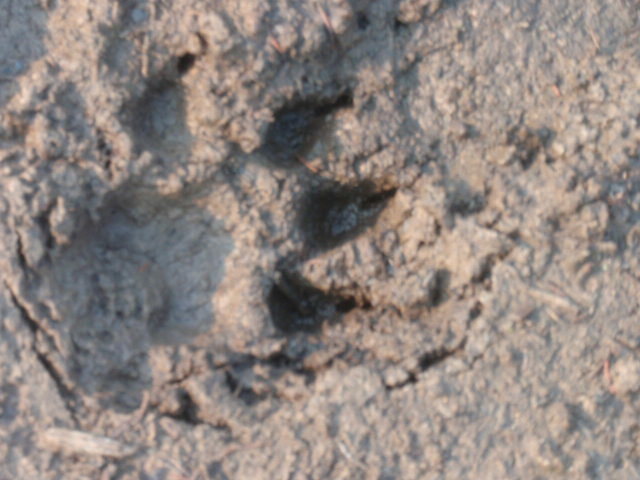 Must be fun to be a dog out here…..plenty of open space, water, things to chase, etc., a 24hr playground. 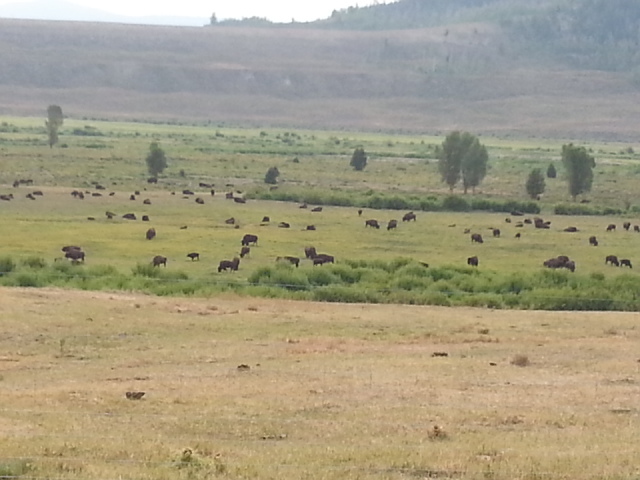 We fished on the upper Hoback, way up into the National Forest Section above Dead Shot, saw some Buffalo on the way in. 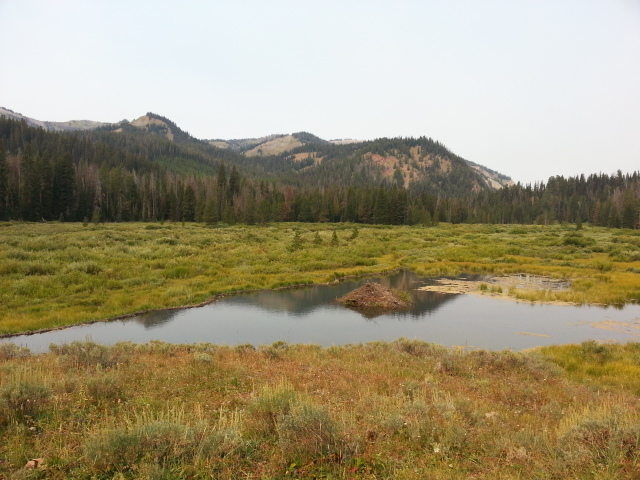 We took the 17 mile trek by national forest road into the backcountry, it was a nice ride, it wasn’t long until the sky became hazy with smoke from some nearby forest fires. It got fairly smoky too. We could see the smoke plumes from where we were fishing and we fished til midafternoon and it got pretty hazy. 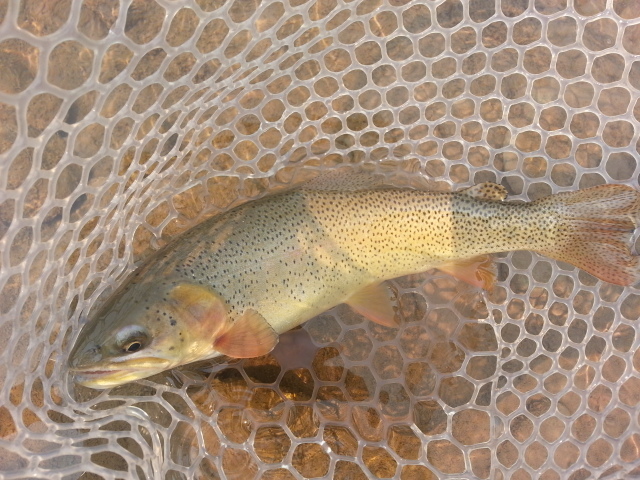 We did ok, netting about 25 to 30 finespot cutthroats and all on dry flies. Big then small, then something else small seemed to produce pretty well. The Tan Fat Albert was the fly to have. Had a killer cowboy steak last night prepared expertly by our friend Carlton at Black Powder Ranch. It was great. We had dinner, recounted the day’s and week’s fishing, and enjoyed some great fellowship over a fantastic meal. We are headed out to the Greys River today, breakfast is coming, and I am packing lunches and as soon as we are done with breakfast we’ll be on our way.